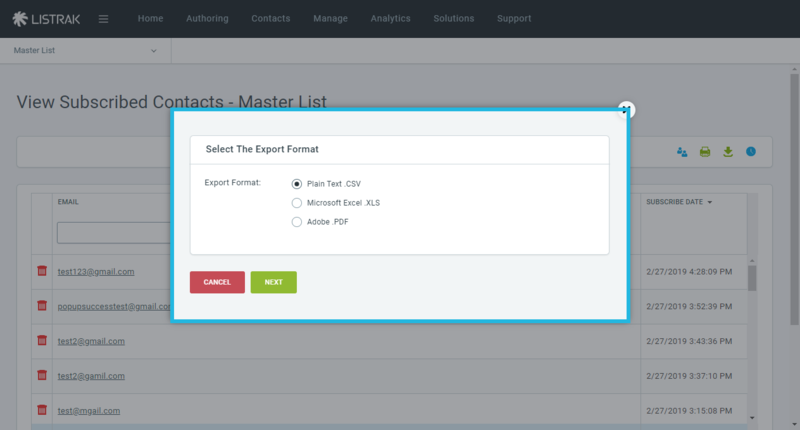 The steps below define how to export your entire list of subscribed contacts in the form of a plain text .csv, Excel .xls, or Adobe .pdf file. 2. Then hover over View. 3. Click on Subscribed Contacts. 4. Then Export List Wizard. 5. Choose the format you want to export and click Next. 6. 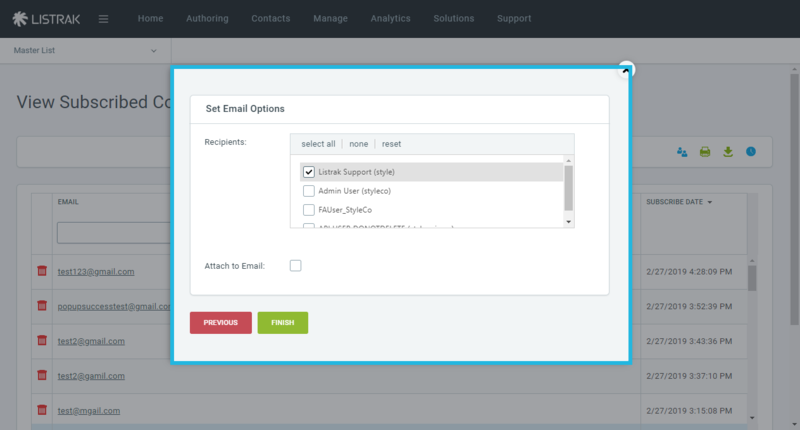 Next, choose any segmentation fields and system fields to include when exporting contacts. You will need to check each box you want to export or click select all to select every field. When finished click Next. 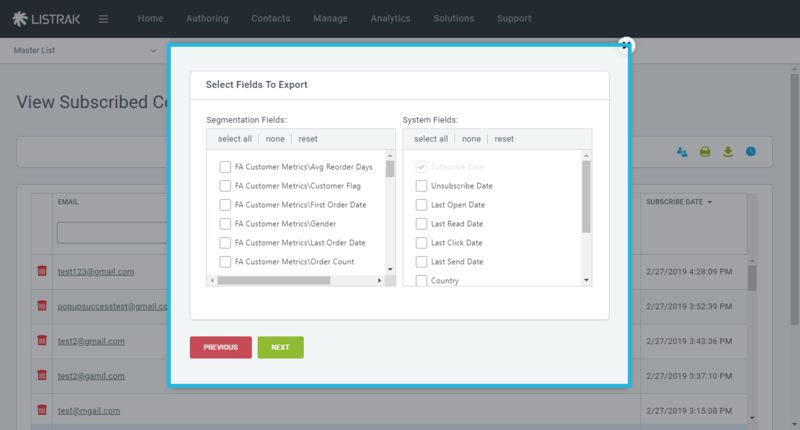 NOTE: Segmentation and system fields selections are only available for .csv and .xls export formats. You will not see this option if using a .pdf format. 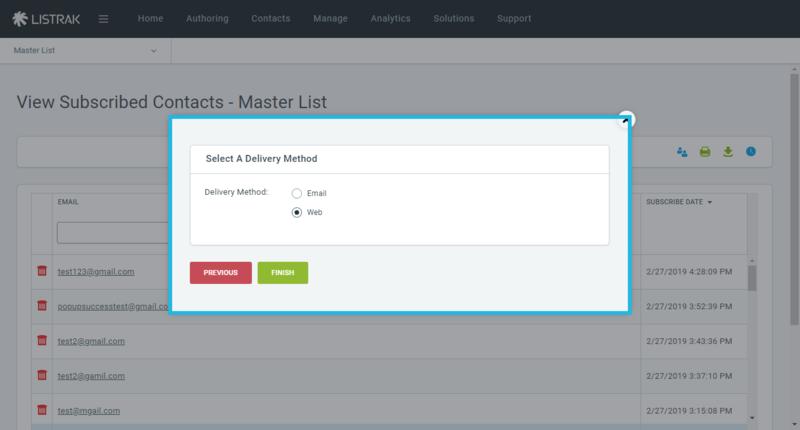 The columns that are always automatically included are Email, Subscribe Date, and Method. 7. Now select whether you want to download the file through a browser (web) or receive an email with a link or attachment. If exporting a large list (over 500k), we recommend choosing email because it may take a long time to load in the browser. If you've selected email, click Next. If web is selected click Finish and download your file. You can skip Step 6 with this option because the task has been completed using this method. 8. If you've selected email as your delivery method, select your recipients. The from email address that is used is the address that is tied to the username in Listrak. Additionally, you have the option to download the file as an attachment. To select this, check Attach to Email. NOTE: The file link contained in the email will expire within three days.